Looking to add protein to your morning bowl of oats? Try adding cottage cheese to your oats. It makes them extra creamy and adds a huge boost of protein! Add oats, banana slices and sea salt to a pot. Add water/milk and stir to combine. Add cinnamon and vanilla, if using. Heat over medium-high heat for 8-10 minutes or until all the liquid has been absorbed. Be sure to stir the oats several times while cooking to make sure the banana slices melt into the oats. You’ll know the oatmeal is done when all the liquid is absorbed and the oats are thick and fluffy. Remove oats from the heat and stir in cottage cheese. Start with 1/4 cup and add more if you’d like. Transfer oats to a bowl and top with your favorite oatmeal toppings. I used flaxseed, peanut butter, banana slices, almond slices and coconut flakes. 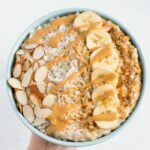 You don’t have to cook the oats with a banana, but I like the sweetness it adds. Instead of the banana you could add another natural sweetener to sweeten the oats. Some options: maple syrup, honey, coconut sugar or even stevia.